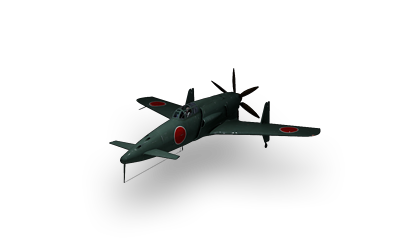 Developed in 1942–1945 for the Imperial Japanese Navy as a successor to the A6M. Only 8 prototypes were produced and tested by the end of the war. Fantastic DPS and good accuracy with the model 5 guns. improved thrust and engine power for its tier over zero predecessors. Is very prone to crits, especially engine knockouts and fires. Massive. Comparable in size to the Me 262 HG II. Size makes it a easy target. Still sluggish for its tier despite improvements. In April 1942, the development of the A6M3 and the 14-Shi interceptor was complete, and the Japanese Navy once again tasked Mitsubishi and Horikoshi's team with designing a new Zero successor to become the Navy Experimental 17-shi Ko (A) Type Carrier Fighter Reppu. In July 1942 the Navy issued specifications for the fighter: it had to fly faster than 345 kn (639 km/h) above 6,000 m, climb to 6,000 m in less than 6 minutes, be armed with two 20 mm cannon and two 13 mm machine guns, and retain the maneuverability of the A6M3. As before, one of the main hurdles was engine selection. To meet the specifications the engine would need to produce at least 2,000 hp, which narrowed choices down to Nakajima's NK9 (Ha-45) or Mitsubishi's MK9 (Ha-43), which were both under development. The early NK9 had less output but was already approved by the Navy for use on the Yokosuka P1Y Ginga, while the larger MK9 promised more horsepower. With the larger, more powerful engine, wing loading became an issue. The Navy requested at most 150 kg/m², but wanted 130 kg/m² which complicated design considerations further. With the NK9 it could achieve 150 kg/m², but with the less power it would not meet the specifications for maximum speed. With the MK9 the engineers concluded it could fulfill the requirements; however, production of the MK9 was delayed compared to the NK9, and the Japanese Navy instructed Mitsubishi to use the NK9. Work on the 17-Shi was further delayed by factories prioritizing A6M and Mitsubishi G4M production as well as further work on A6M variants and addressing Raiden issues. As a result, the 17-Shi, which became the A7M1, officially flew for the first time on 6 May 1944, four years after development started. The aircraft demonstrated excellent handling and maneuverability, but was underpowered as Mitsubishi engineers feared, and with a top speed similar to the A6M5 Zero. It was a disappointment, and the Navy ordered development to stop on 30 July 1944, but Mitsubishi obtained permission for development to continue using the Ha-43 engine, flying with the completed Ha-43 on 13 October 1944. The A7M2 now achieved a top speed of 628 km/h, while climb and other areas of performance surpassed the Zero, leading the Navy to change its mind and adopt the craft. The A7M2 was also equipped with automatic combat flaps, used earlier on the Kawanishi N1K-J, significantly improving maneuverability. While it was hoped that the A7M would replace the A6M, production was disrupted by an earthquake on December 1944 in the Nagoya region, and Allied bombing raids on 11 March 1944, which caused the loss of full scale drawings and jigs for the Sam 12 (A7M2) and Ki-83. Only nine aircraf were completed by the end of the war. The type never saw combat. This page was last modified on 9 March 2019, at 18:24.